Whilst the mortgage industry comes under ever increasing regulatory and service scrutiny, with more rigorous standards imposed to reinforce responsible lending and reduce fraudulent activity, we are seeing positive effects on those involved in the end to end mortgage process including brokers, lenders and surveyors. Lending criteria has become more complex in today’s volatile housing market, with tougher checks on individual borrowers as well as on bricks and mortar assets since the introduction of the new PRA II rules. The mortgage process is understandably feeling the pressure under the weight of existing and new legislation, which ultimately effects the end customer applying for a mortgage, impacting service delivery and layering more frustration on the house-buying process. Technology can play a significant part in linking each stage in the process from a mortgage application, underwriting, property valuation, conveyancing through to completion, consequently speeding up the time it takes through better availability of data and provision of back office systems that are integrated and configurable. We are seeing new software coming to the market providing opportunities for brokers, lenders and surveyors to change the way they operate. The recent changes in legislation affecting the buy-to-let market, has led to increased requirements for information and checks against each mortgage application, including credentials for other properties in a landlord’s portfolio, as well as business plans, assets and liabilities statements. How is the industry responding to the challenges set out by the PRA? We are hearing about some lenders withdrawing from the portfolio buy-to-let market, others leaving the administration headache to the broker, with some taking on the administration responsibility seemingly lightening the load for the broker. Whilst the increase in volume of work could put the broker out of pocket, simply shifting the problem elsewhere doesn’t resolve the potential for increasing turnaround times for a mortgage offer, which remains lengthy and time consuming. Not only is the amount of administration surrounding property portfolio details a cause for concern, but we are also hearing about the complexity surrounding individual lender criteria and the documentation requirements brokers are expected to retain. On the contrary, those lenders who have adopted new technology to help remove the problem altogether have been able to strip out the lengthy administration and complexities and make the process streamlined and simple. There are numerous benefits to both the lender and broker, as well as the end customer with a reduced turnaround on each buy-to-let loan application. Technology like eTech’s web based Buy to Let Hub solution can reduce time spent on formatting portfolio data, with instant upload of property information from any excel spreadsheet and automatic property verification. Automatic conversion of data into lender specific templates ensures information is accurately presented without having to manually check. 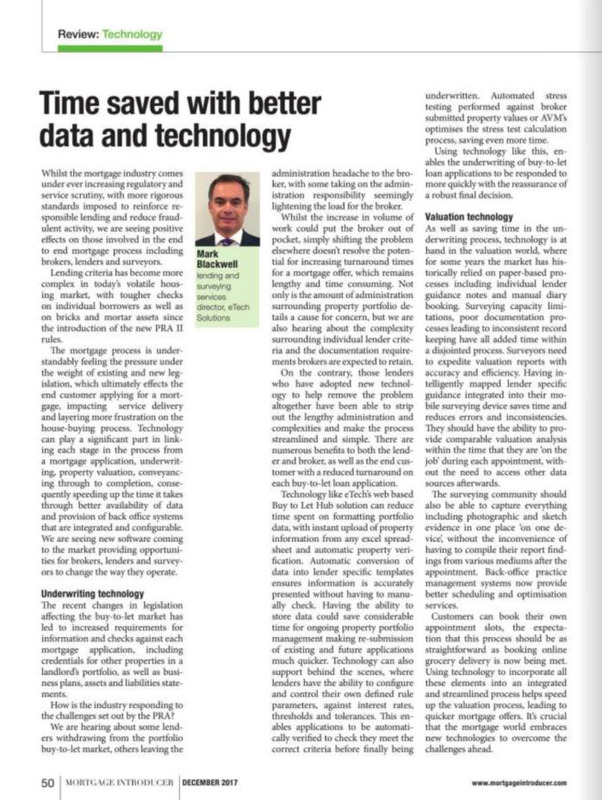 Having the ability to store data could save considerable time for ongoing property portfolio management making re-submission of existing and future applications much quicker. Technology can also support behind the scenes, where lenders have the ability to configure and control their own defined rule parameters, against interest rates, thresholds and tolerances. This enables applications to be automatically verified to check they meet the correct criteria before finally being underwritten. Automated stress testing performed against broker submitted property values or AVM’s optimises the stress test calculation process, saving even more time. Using technology like this, enables the underwriting of buy-to-let loan applications to be responded to more quickly with the reassurance of a robust final decision. As well as saving time in the underwriting process, technology is at hand in the valuation world, where for some years the market has historically relied on paper-based processes including individual lender guidance notes and manual diary booking. Surveying capacity limitations, poor documentation processes leading to inconsistent record keeping have all added time within a disjointed process. Surveyors need to expedite valuation reports with accuracy and efficiency. Having intelligently mapped lender specific guidance integrated into their mobile surveying device saves time and reduces errors and inconsistencies. They should have the ability to provide comparable valuation analysis within the time that they are ‘on the job’ during each appointment, without the need to access other data sources afterwards. The surveying community should also be able to capture everything including photographic and sketch evidence in one place ‘on one device’, without the inconvenience of having to compile their report findings from various mediums after the appointment. Back-office practice management systems now provide better scheduling and optimisation services. Customers can book their own appointment slots, the expectation that this process should be as straightforward as booking online grocery delivery is now being met. Using technology to incorporate all these elements into an integrated and streamlined process helps speed up the valuation process, leading to quicker mortgage offers. It’s crucial that the mortgage world embraces new technologies to overcome the challenges ahead.